Thanks, Jonathan. Yes the official website is coming. Meanwhile thanks for posting the Facebook address for RipperCon which we hope will enable a number of people to get the information about the event and sign up. David Sterritt - "The Ripper, the Lodger, and Hitchcock's Existential Outsider"
Robert Anderson - "Long Island Serial Killer"
Sarah Beth Hopton - "Jill the Ripper/Mary Pearce"
Howard Brown - "Diamonds in the Rough: A Positive View of the Contemporary Papers"
Christopher T. George - The Last Days of Edgar Allan Poe -- Murder or Something Else?" M/Cs for the weekend are Jonathan Menges of Casebook: Jack the Ripper's Rippercast and Casebook's Ally Ryder. Unfortunately Robert House, previously announced, has had to withdraw for financial reasons. Jonathan Menges has informed me that because of the rebranding of the hotel, they will not accept reservations for our group until February. Thanks for the notification, Jonathan. We will keep everyone informed as to when the reservation desk is open for Rippercon room bookings. NOTE: The hotel for RipperCon, currently known as the Wyndham Mount Vernon Hotel, shortly to become the Mount Vernon Hotel, will not take bookings for RipperCon until after February 2. Our contact at the hotel advises: "So please hold off until I get a definitive booking information and our hotel is loaded on the Global Distribution System (GDS) so that folks can find us. Right now they would not be able to book as Wyndham ends Feb 2. Once we have more info I will then give you the web site to the hotel." Anyone flying into Baltimore should preferably choose to fly into Thurgood Marshall Baltimore Washington International Airport (BWI) in preference to Dulles Airport or Reagan Airport in D.C., both of which are further away. The Mount Vernon Hotel which will be our base for #RipperCon is a fairly short cab ride from BWI. Despite the fact that, as with previous U.S. and U.K. conferences, the event will naturally largely focus on the Whitechapel Murders, as you might expecte, for the first time in a JtR conference on either side of the Atlantic, there will be a strong element about Poe and the writer's many connections to Baltimore, and, unlike earlier U.S. conferences, we are meeting in a downtown historic area which will add materially to the experience of the weekend. Our Sunday RipperCon bus tour of Baltimore will visit Edgar Poe's tomb and house on S. Amity Street and other locations, including the site of his death, the site of the tavern where he was found in a dying condition, and the house, still standing (! ), where Poe secured his first literary success. Also -- we will point out sites connected to John Wilkes Booth, the Pinkertons, the U.S. Civil War, and Jack the Ripper suspect Dr. Francis Tumblety, who lived in the city at the time of the 1900 U.S. Census. 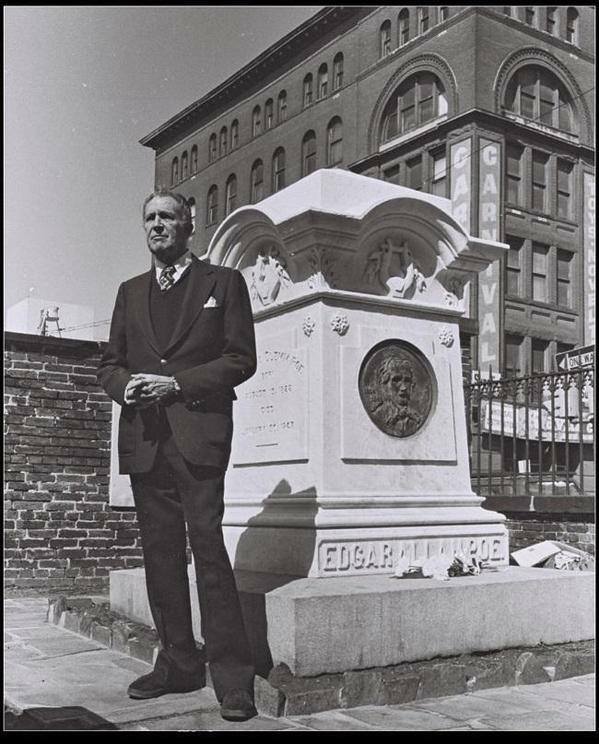 The late actor Vincent Price at Edgar Allan Poe's tomb in Baltimore. Courtesy, Jeff Jerome. Last edited by ChrisGeorge; 01-28-2016, 03:44 AM. I would like to add an enticement. I will be using the RipperCon to present over a dozen discoveries on Whitechapel murder suspect Francis Tumblety (I've been busy this year! ); some quite significant. Additionally, I have the permission of Roger Palmer and Joe Chetcuti to present their discoveries. I can guarantee your opinions on Francis Tumblety as a Ripper suspect are based upon incomplete information. These discoveries need to be scrutinized, so I hope you can make it! Sounds fabulous! We'll look forward to hearing your talk. Clearly your talk is going to be packed with new nuggets of information on this intriguing suspect.... the ever enigmatic Dr T. You might need more than the one hour I was planning to allocate to you. Ha ha. Last edited by ChrisGeorge; 01-29-2016, 12:09 AM. We have many exciting talks planned for RipperCon in Baltimore. The conference will be held on April 8 to 10. Please hurry and sign up. We do not want anyone to miss out on this great program. Mike Hawley has promised to disclose several discoveries on the suspect Tumblety. No one should miss that. I need to get up additional linked pages giving the schedule and information on the Maryland Historical Society and the hotel. However the essentials on what the event is about and on the speakers are live already. As Barrister recommends, don't miss out! Last edited by ChrisGeorge; 02-04-2016, 08:27 AM. Good news! After changing ownership, the Mount Vernon Hotel, our base hotel for RipperCon April 8-10 in Baltimore, can now take bookings. See below. We just now have our systems up and running. Below is the link for your group. All they have to do is click and book their rooms. Please let me know if you have any other questions. Thank you for you patience. As noted, our base hotel for RipperCon is the Mount Vernon Baltimore Hotel, a block east of the Maryland Historical Society where the talks will take place 1 pm to 6 pm on Friday, April 8 and 9 am to 5 pm on Saturday, April 9, with the bus tour taking place on the morning of Sunday, April 10 as the last event of the weekend. It all sounds splendid, but I can't afford it. Are the lectures ever made available for us to hear later? Jonathan Menges is planning a podcast during the event. At RipperCon there will be two panels: a Panel on Ripper Fiction on Friday afternoon featuring David Sterritt, Stephen Hunter, and Lenne Miller (Mr. Hunter's researcher) to be moderated by Janis, and a Panel on Ripper Suspects on Saturday morning including Martin Fido, Robert Anderson, and Michael Hawley, to be moderated by Jonathan Menges. We have added a talk on The Ripper, Sherlock Holmes, and Sir Arthur Conan Doyle where Janis Wilson and I will talk on the topic. 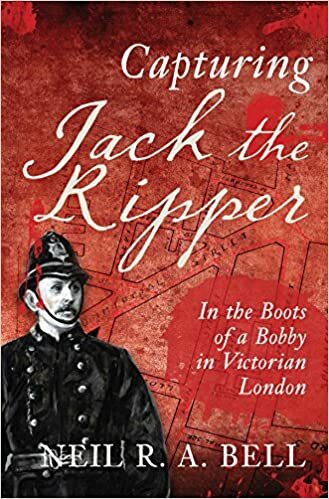 Also I am planning for Saturday lunchtime a trivia session which will feature book prizes, including a signed copy of Neil Bell's excellent Capturing Jack the Ripper: In the Boots of a Bobby in Victorian London, which Neil is kindly sending over especially for RipperCon. Many thanks in advance, Neil! Before my talk on the mystery about the death of Edgar Allan Poe in Baltimore in October 1849, we will have a wrap-up discussion between the speaker and the audience on "The State of Ripperology Today." 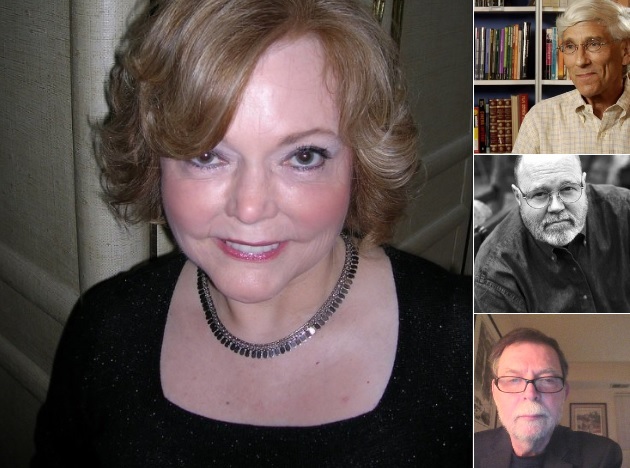 Janis Wilson will chair a panel on Ripper fiction at RipperCon in Baltimore April 8-10, 2016, with David Sterritt, Stephen Hunter, and Lenne Miller http://rippercon.com #jacktheripper conference! Don't miss out!